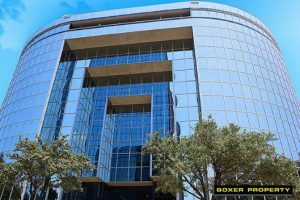 November 7, 2016 (Dallas, TX ) – Boxer Property is pleased to announce that the Trinity Universal Insurance Co. has renewed its lease in Executive Center II located at 8330 Lyndon B. Johnson Freeway , Dallas, TX. Trinity Universal has occupied over 84,000 square feet of office space in the complex since 2002, and the renewal is for ten years. Senior Broker Mark Dowdle negotiated the lease on behalf of Boxer Property. Calvin Nash AVP Real Estate for Kemper along with Dan Fisk and Chris Wood with Cushman & Wakefield’s Chicago office represented the tenant. Executive Center II & III each have 12 floors for a total of 381,383 square feet of office space on Lyndon B. Johnson Freeway. Striking mirrored architecture and crisp landscaping frame a grand entryway that leads to renovated lobbies, a fitness center, and a cafe. Tenants enjoy access to two conference rooms, an 85-seat auditorium with stadium-style seating, and a loading dock. The buildings have onsite leasing, maintenance, and property management and includes 24-hour security as well as free controlled-access garage parking. The offices are convenient to nearby restaurants, retail shopping, and fitness centers, as well as The Westin Park Central, Texas Instruments, and Medical City Dallas Hospital. The DART LBJ/Central Station on the Orange and Red Lines is one mile away, while DFW International Airport is less than 20 miles. Trinity Universal Insurance Company operates as a subsidiary of Kemper Corporation and provides property and casualty insurance products and services. The company primarily engages in the private passenger auto liability business as well as personal and commercial coverage, including homeowners, liability, and workers’ compensation insurance services. The company was founded in 1926 and is based in Dallas, Texas.